Qualifying for Kona is only the first step, once you’re past that hurdle you still have to race there. While many are content to enjoy the experience, most want to put in a good showing on the island. 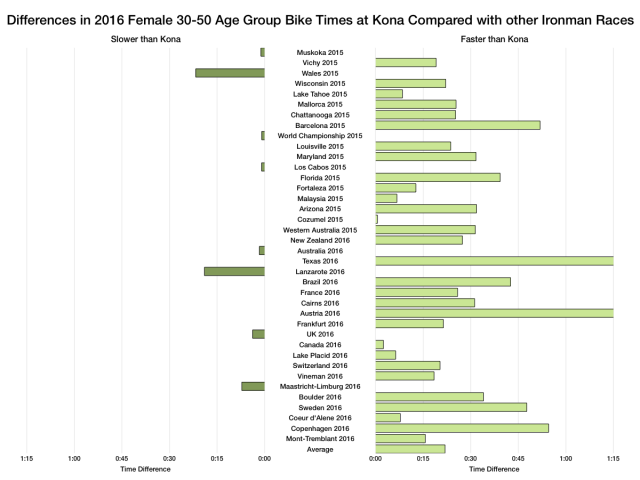 So the inevitable question is how does Kona compare? 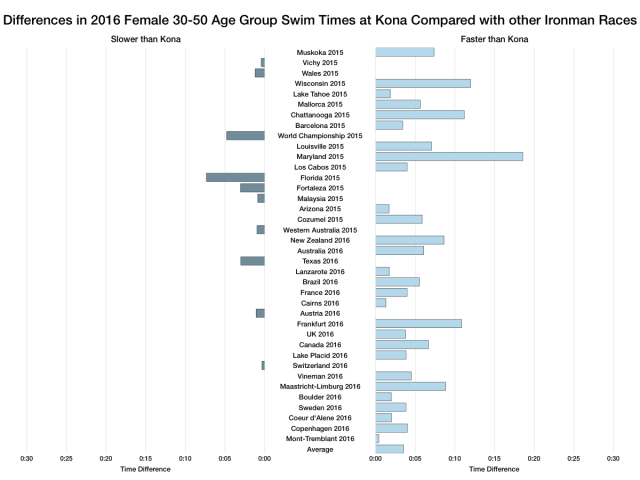 If you qualified in a 9:10 at Ironman Barcelona what might you be able to do in Hawaii? Setting aside the obvious, it depends, I can compare the finishing times of this year’s Kona athletes with those from their qualifying races to establish the typical difference in performance between races. I did this last year where we saw that Wales and Lanzarote were the only events where athletes were slower. We know 2016 was a faster race, let’s see how it compares. The list of slower races expands beyond just Wales and Lanzarote. 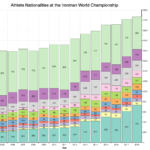 We can add the 2015 World Champs to the list for both men and women; this year’s race was a faster day. We can also add Los Cabos and Malaysia for the men, both those events appear to have been slower for qualifiers than the race itself. The rest of the calendar is faster, sometimes by more than an hour. Naturally I can break this down further to look at individual disciplines. 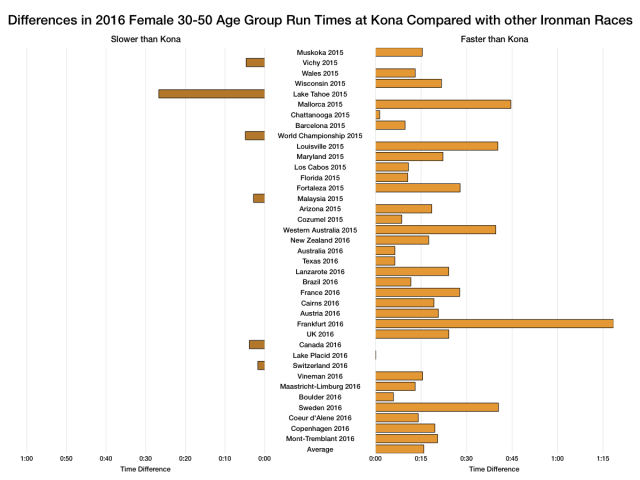 Before I do, it’s worth noting that for this analysis I limited comparisons to athletes in age groups between 30 and 50. These are the largest groups and tend to give the most consistent figures which suits my purposes here. 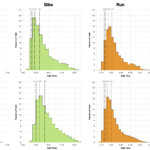 Expanding to include all age groups doesn’t make a huge different to these results. The adjustments to this year’s swim, apparently a correction of the course, had a clear impact on swim times. Roughly a quarter of races had slower swims than Kona, the difference not much more than the shift we saw in Kona’s swim times this year. 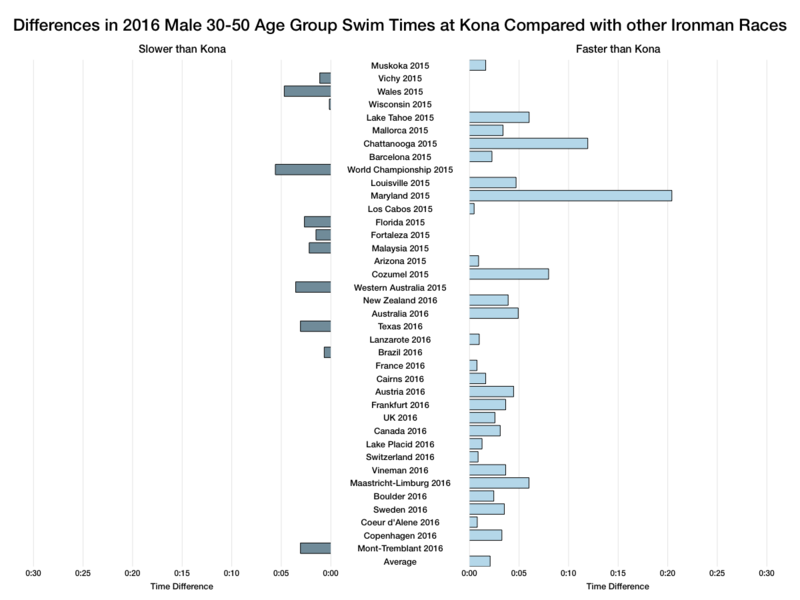 In my previous analysis only one or two events had slower swims than Kona. Although Kona is not an easy bike course due to the winds, it’s not the toughest Ironman course either. 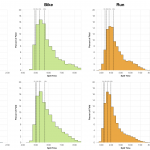 Around a third of races had slower bikes this year. 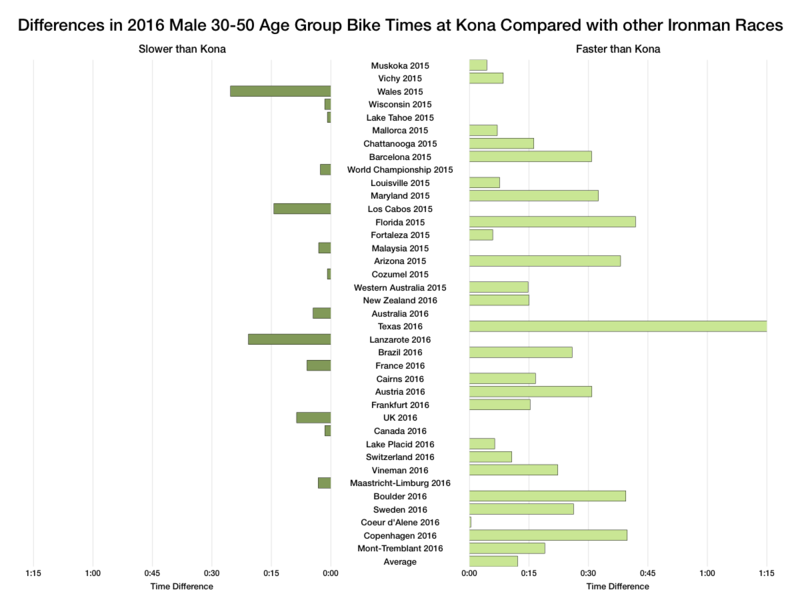 There are obvious suspects like Wales and Lanzarote, along with Los Cabos which returned to a slower bike course last year. A handful of other events proved slightly slower too. The run is the real differentiator in this race. Heat and humidity take their toll over a long day. 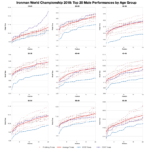 For male athletes the only event slower than this year’s run was 2015’s race. For the women there’s a few races with one outlier being Ironman Lake Tahoe. I’m a little suspicious of that result – and suspect I have a relatively small sample of useful data that’s skewing the numbers. 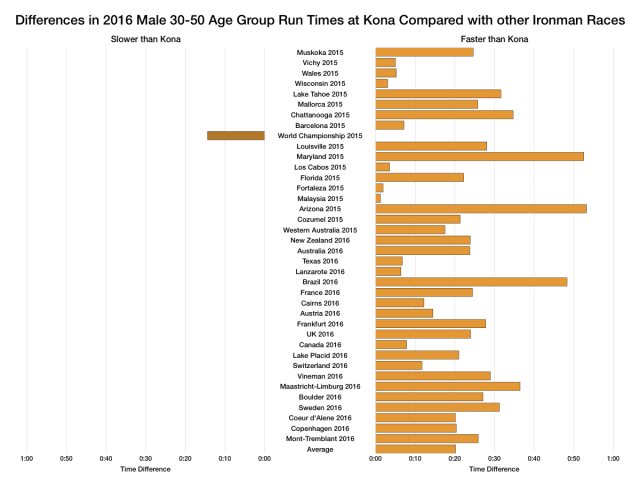 Still, for the most part it’s clear the run in Kona is a much slower affair. 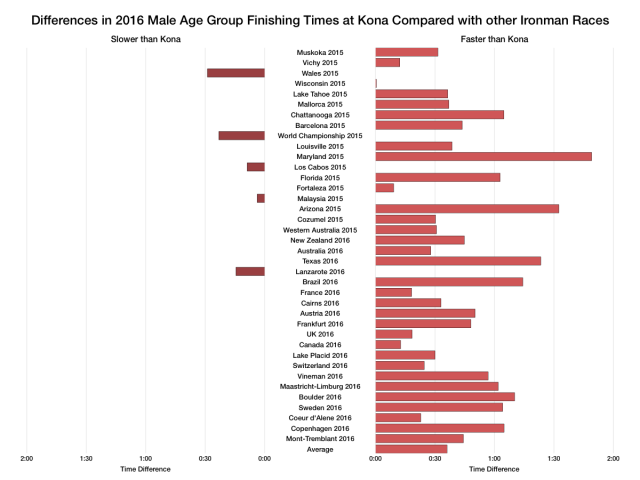 Unless you happen to race in particularly tough conditions – very hot, very humid, very hilly or very windy – then you’ll probably be slower in Hawaii. 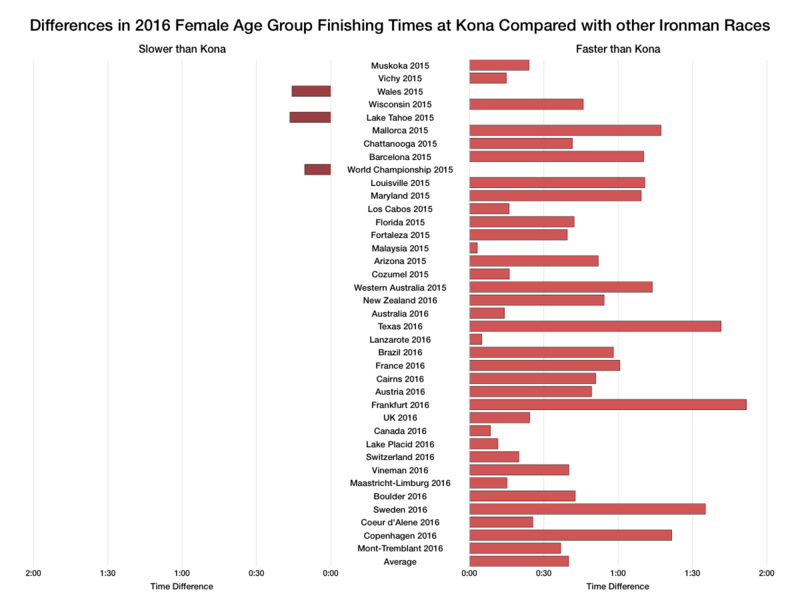 It’s no surprise really, Kona presents the conditions that tend to have the biggest impact on race times. Wetsuit bans slow the swim, high winds slow the bike and heat and humidity reduce athlete performance in general. They can’t all be controlled, but they can be trained for and their impact minimised. 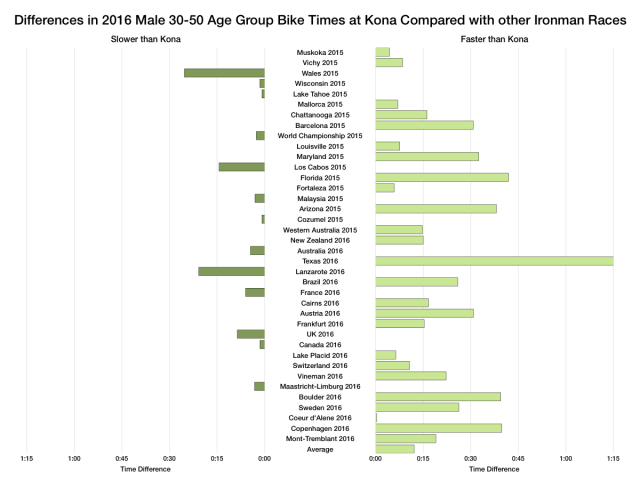 Whether you are slower in Kona and if so, by how much, comes down to how you prepare.